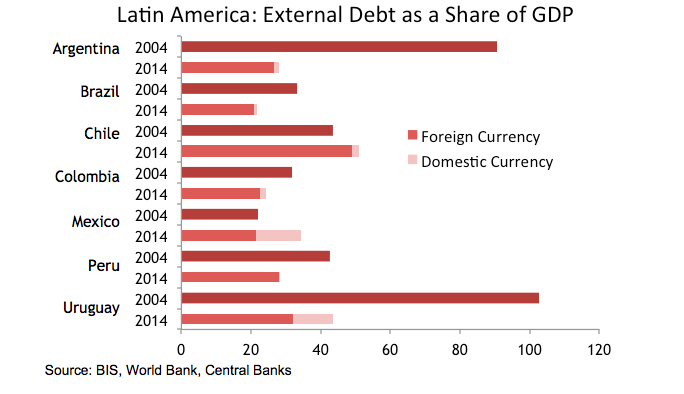 With the US Federal Reserve contemplating a rate hike as early as Spring 2015, how much leeway do Latin American central banks have to set rates? The short answer is not much. We’ll have a better idea as early as mid-December, when the central bank presidents of Mexico, Chile, and Peru decide whether to administer another shot in the arm to their now-ailing economies. Mexico, Chile, and Peru – along with Colombia – have been dubbed the Pacific Pumas for their openness to free trade, their high growth rates, and for their orthodox macroeconomic policies. And while most emerging markets have raised interest rates to keep their currencies afloat, Mexico, Chile, and Peru have acted aggressively to slash rates over the past year, betting that a monetary easing could help bring back some of the purr. A rate cut to revive growth is nothing out of the ordinary – indeed, it is textbook macroeconomics – but the prospect of a rate hike in the United States has put emerging markets in a familiar bind: raise rates in tandem, or risk a vicious cycle of plunging currencies and capital flight. Economists call it the fear of falling, but Chile’s Rodrigo Vergara for one, isn’t afraid to fly. Vergara’s Bank of Chile has slashed rates by 200 basis points – or 2 percent – since the start of 2013, the most among emerging markets. Central bank data show Chile growing at its slowest pace since 2009, amid a global slowdown in demand for copper – the country’s principal export. “We are not happy with this level of growth,” the central bank president told Bloomberg News late November after surprising markets with an additional 25 basis point cut. Economists say another cut may be in store this December. Peru has also lowered rates to combat a slowdown in mining investment, albeit a less severe one, while a slump in domestic demand has prompted Agustin Carstens’ Bank of Mexico to lower rates in June. 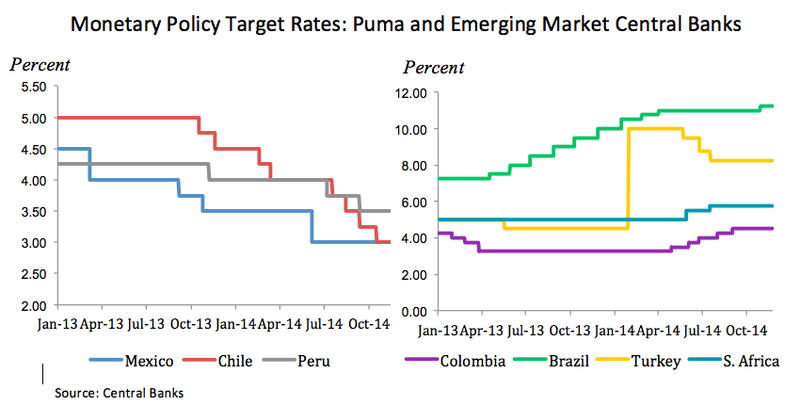 Colombia, Latin America’s fifth inflation targeter, faces a rather enviable problem. With growth now at Latin America’s highest, the Bank of Colombia has raised rates to temper inflation. In contrast, Brazil, Turkey, Indonesia, India and South Africa – the emerging markets “fragile five”, so called for their large current account deficits and rising inflation – have hiked rates by as much as 400 basis points to combat sharply depreciating currencies and capital flight. While the central banks of Mexico, Chile and Peru are also facing inflationary pressure, they share three features that have allowed them to lower rates despite the prospect of depreciating currencies and capital flight. 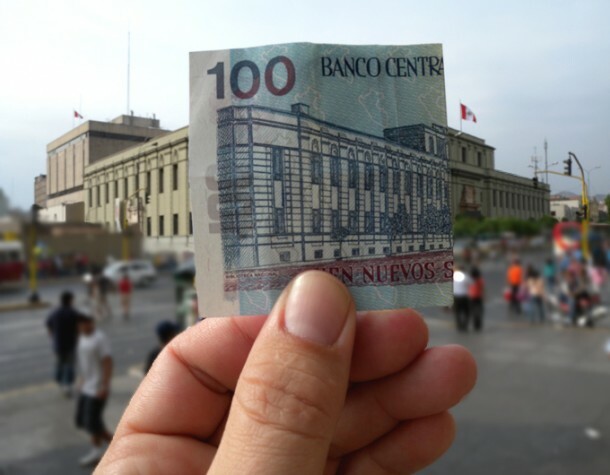 In October, Peru’s finance minister announced that the country will sell US$500 million in ten-year, sol-denominated bonds, while in Mexico, the peso has become the currency of choice for large corporates, as evidenced by America Movil’s US$1.2 billion dollar peso-denominated debt issue in 2013. Lower exposure to dollar-denominated debt – on the part of both governments and the private sector – will give central banks greater space to reduce rates without weighing down balance sheets. Second, fiscal discipline has supported the banks’ mandate to keep inflation within a narrowly defined range. Peru’s government will run a budget deficit for the first time since 2010, and while Mexico may have its fiscal house in a bit of disorder, its deficit of 1.5 percent of GDP pales in comparison to Brazil, where the deficit is currently scraping 5 percent. Finally, the three central banks are among the most independent among emerging market inflation targeters. 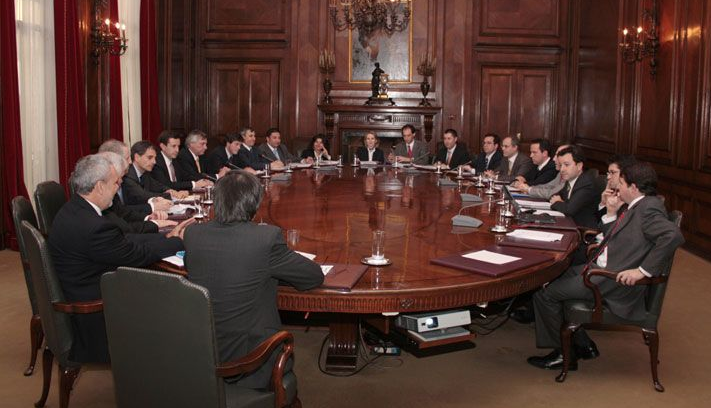 The central bank governors of Mexico, Chile, and Peru tend to span multiple administrations, making them less vulnerable to election year pressure to prime the pump. Such monetary discipline helps to anchor inflationary expectations, reducing the likelihood, as the World Bank has argued, that falling exchange rates will stoke inflation. Though Vergara and Carstens are keeping mum, should growth slow further, they may well be willing to let out their leash. This entry was posted in Andean Region, Mexico + Central America, Southern Cone and tagged base rates, Carstens, central bank, cut rates, emerging markets, fragile five, jesse rogers, Latin America blog, monetary policy, Pacific Pumas, Rodrigo Vergara, taper tantrum. Bookmark the permalink.